Remember the name, because you might see it again: Aisha Mustafa, a 19-year-old Egyptian physics student, patented a new type of propulsion system for spacecraft that uses cutting edge quantum physics instead of thrusters. First, a little background: One of the strange quantum facts at work in Mustafa’s engine idea is that there’s no such thing as a vacuum, devoid of particles, waves, and energy. Instead the universe’s supposedly empty spaces are filled with a roiling sea of particles and anti-particles that pop into existence, then annihilate each other in such a short space of time that you can’t readily detect them. In terms of space propulsion, this is amazing. Most forms of spacecraft rely on the rocket principle to work: Some fuel is made energetic and then thrust out of an engine, pushing the rocket forward. It’s tricky stuff to get right, particularly on Earth, which is why we shouldn’t be surprised SpaceX’s recent launch stopped at the critical moment due to a problem with one of its chemical rocket engines. For in-space maneuvering, many different types of rocket are used, but even exotic ones like ion drives (shown in a NASA image above) need fuel. The only space drive that doesn’t involve hauling fuel and complex systems into orbit is a solar sail. And Mustafa’s invention can, rudimentarily, be compared to a solar sail…because it doesn’t need “fuel” as such, and exerts just the tiniest push compared to the thundery flames of SpaceX’s rockets. 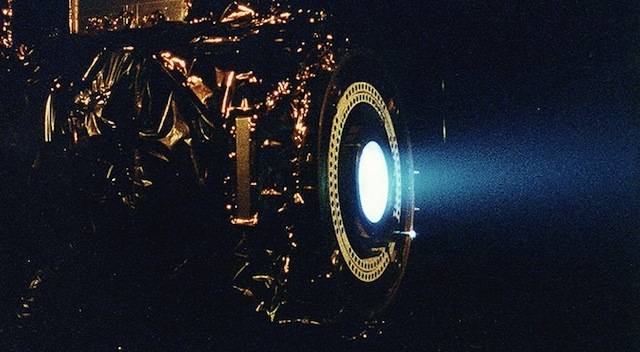 It’s potential is enormous–because of its mechanical simplicity and reliability it could make satellite propulsion lighter, cheaper, and thus indirectly lower the cost of space missions of all sorts.